Becky is a mandolinist noted for her hot improvisational leads and expressive rhythmic drive. She has been performing and teaching for many decades with a wide variety of musical groups and styles. In Houston, Texas, in the mid 1970's, she formed a string band with her brother, Malcolm Smith and her future husband, Pat Fowler. The Cypress Swamp Stompers played everything from Old-time Fiddle tunes, Celtic and Bluegrass to Gypsy & Swing Jazz. She made her own mandolin (based on the 1923 Lloyd Loar Gibson) while attending the University of Houston. In the 80's she relocated to the San Francisco Bay Area where she played in Bluegrass, Swing and Celtic bands and continued to teach and do studio session work. 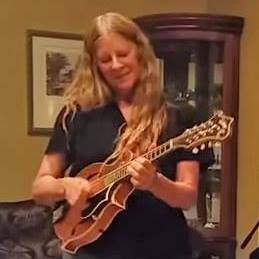 She helped produce one of the most popular mandolin magazines of all time (Mandolin World News), owned by mandolinist David Grisman, and studied with many great players in the Bay Area. In 1988 she moved to a small horse farm in southwest Idaho and teaches private lessons and works at the Pickers Paradise music store in Weiser, Idaho. She travels to Houston and tours with Linda Lowe's "Women in the Round, On the Road", playing in Texas, Alabama, Florida and North Carolina with several well known singer/songwriters.